When I lived in Japan many seasons ago, we used to sing a song in honor of the sakura, cherry blossoms. So when I stepped outside of Suzallo last Sunday and glanced up at the Quad, it was a magnetic attraction. Despite the pouring rain and cool temperatures, there were so many people milling among the trees. They defied the Seattle norm with their colorful umbrellas and bright yellow and red rain jackets. I wedged myself under an arched entryway with a spot of dry ground. It was an odd angle. 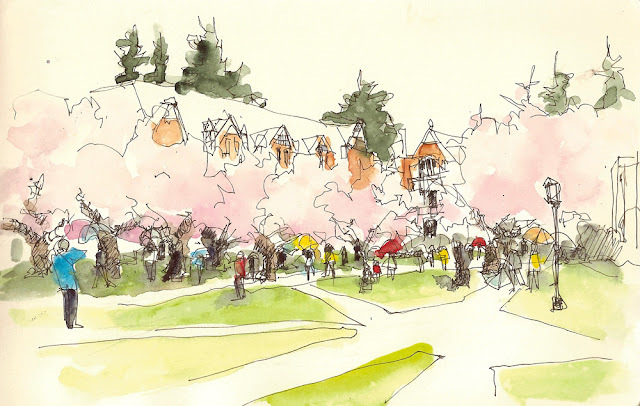 I would have preferred to get a nice perspective of the angling paths of the quad, my fingers got stiff from the cold, and wished I had brought my water-color paper and ink and twig. By the time I was done Suzallo's interior seemed much more welcoming. And then...a brief spell of sunshine. That building in the background by the way is, I believe, the UW Art Department, my old haunt back in the day. Lovely, I might try to go out there this weekend if I have time. It just wasn't a good day for it on Sunday. At least for me too cold and wet! Love this sketch, Jane!! It has a nice feel of sunshine and warmth, unlike the conditions you had to endure!! You really captured the lightness of the cherry trees--something I find very hard to do. It looks inviting--even in the rain.